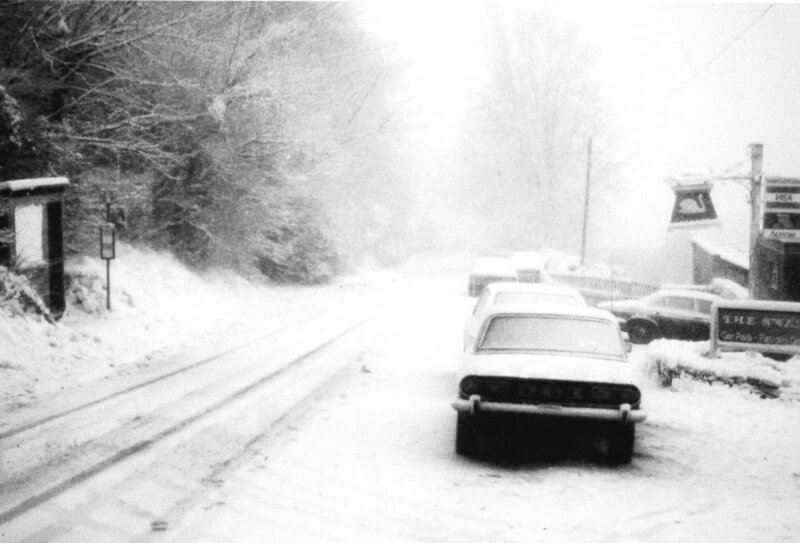 ​If you don’t think The Swan Inn is in a rural location, have a look at the photo above of Kingsdown in the 1970s. The pub has often been described as in a precarious position both on the edge of a cliff and isolated from many local houses by difficult roads and tracks. As well as these problems, adverse weather severely affects the pub as can be seen from the photos below taken in 1962. In 1995 matters came to a head when the following notice appeared in Kingsdown. Gibbs Mew are selling the Swan Inn, Kingsdown. It will probably close. You can help to prevent this by attending a public meeting at the pub on Tuesday 11 April 1995 at 7.30 pm. SWAN SONG Regulars hope to save their local. Regulars at a village pub are so angry it is being put up for auction that they are rallying round to try to buy it themselves. The landlord and landlady at the Swan Inn, Kingsdown, near Bath, received a letter from their brewery last week saying the pub was being put up for auction at the end of May (1995). But locals are furious and are meeting tonight to see if they can raise the £200,000 needed. My husband and I filled in the petition to Gibbs Mew sent to us by Sam Eley, that the Swan should only be sold as a licenced premises and for no other use. Either Sam or her husband John was a trained chef – hence the reference to the good food. The pub was saved but continued to have problems of erosion, location and adverse weather. It is remarkable that it has been a survivor when so many other pubs in the village have been closed.